Four minutes to spare? Then Film Studies For Free respectfully recommends that you spend them visiting the BBC site where they have a great little audio slideshow in which Sir Ken Adam, the production designer of James Bond films (and many other films besides), ‘shares his thoughts on two of his most celebrated [Bond] sets’. Check out the link HERE. 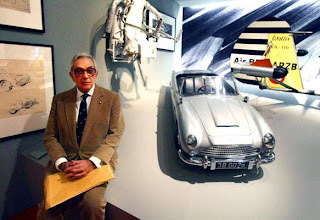 It’s been posted to the BBC pages in connection with the publication of Ken Adam Designs the Movies, James Bond and Beyond by Ken Adam and Christopher Frayling (by Thames and Hudson). See the Commander Bond fansite HERE for further info. Eight more minutes to spare? See a great YouTube video about Adam’s work HERE.